‘Twas the night before Labor Day, and the grill was alight. This isn’t going to be a poem, though that would be fun. 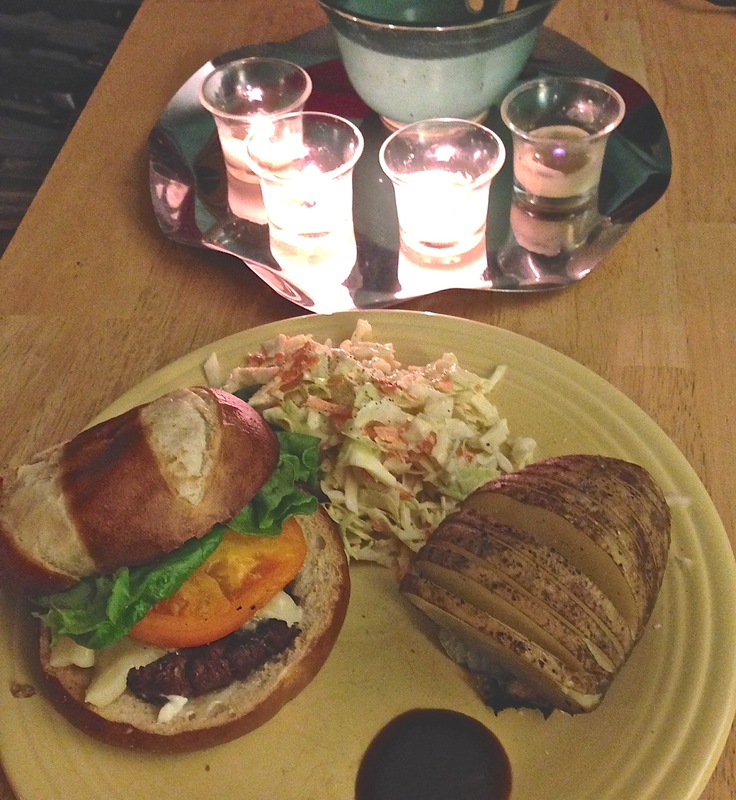 Nor was this a “oh, gosh, it’s the last gasp of summer, we have to have a cookout!” sort of panic. It was burgers. One of which was going to be well-done and not one degree beyond. The smoke detector was not going to sound. The burgers were originally intended to come from the awesome burger place our neighbor suggested, but they’d closed early for the holiday weekend. Thus, 80/20 chuck was defrosted and formed into patties–one thick and narrow, one thin and wide, so they’d cook to the desired doneness in approximately the same time. Potatoes were sliced thinly through most of their cross-section, buttered, salt-and-peppered, and foil-wrapped for tucking into the coals. Cabbage was sliced and carrots shredded for slaw. The charcoal was lighted. The grill-grate was cleaned and swabbed with oil. All was right with the world. Not cute little sprinkles, either. Let’s-get-this-over-with buckets. The kind that makes you consider gathering the animals by twos. And thus it was that I fetched an umbrella and became one of those suburban guys who stands on the deck, grilling in the rain. The burgers were worth it. I am afraid her umbrella may smell a little smoky the next time she needs to use it. Nothing says “end of summer” like taking off your wet shoes and plating a pretty-much-perfect dinner. 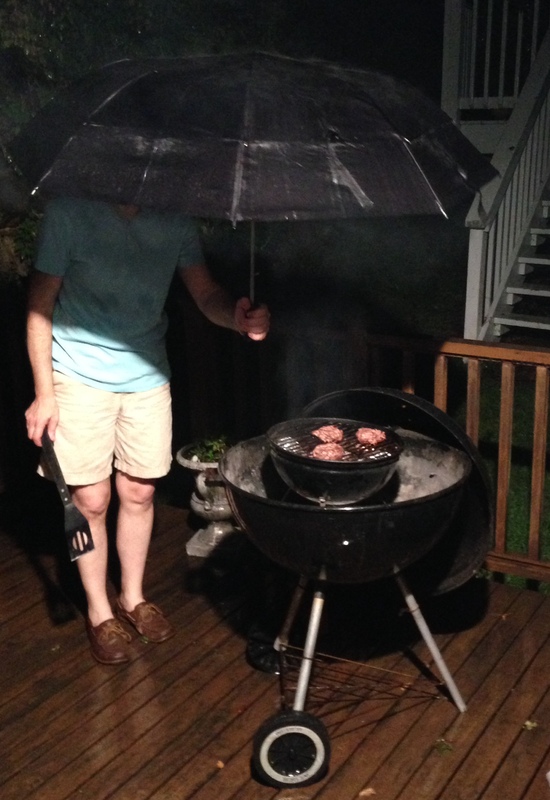 This entry was posted in Uncategorized and tagged Grilling, Rain, Sunday. Bookmark the permalink.